Born in Newcastle upon Tyne in the North of England. After leaving school, he began an apprenticeship in the Shipyards as a Marine Engine Fitter and then trained as a Design Draughtsman. With the decline of the Shipbuilding Industry, he trained as a Secondary School teacher and taught Design Technology, in a number of schools. In 1980, he began his training at Ushaw College, senior Seminary near Durham City and was ordained for the Hexham and Newcastle Diocese in June 1985. His first appointment as Assistant priest was in Durham City with two churches, four Hospitals and two, schools within the parish. After four years he was asked to take up the position of Pastoral Director on the staff of the Seminary, a position he held for six years. Leaving the seminary he was appointed parish priest of the Parish of St Joseph in Newcastle City and took up the responsibility of Dean of the Newcastle West Deanery. In December 2002, he was granted a sabbatical year to investigate the possibility of his ministering in Australia. The main reason being that the majority of his family was living in Brisbane. ​In January 2003, he took up the position of Assistant Priest at St Mary’s in Ipswich. 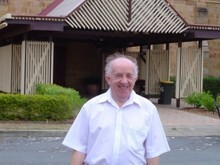 August 2004 he was granted Permanent Residency in Australia and released from the Diocese of Hexham and Newcastle. The Archbishop incardinated him in to the Brisbane Archdiocese. With the withdrawal of the Augustinian priests, the parish became vacant and Fr Roger was appointed to St Francis Xavier Parish in December 2004. He commenced on 1st January 2005. 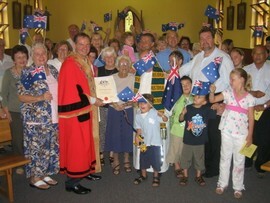 In December 2006 Fr Roger received Australian Citizenship during a ceremony held in St Francis Xavier’s Church.